I have several books on stitching seams for crazy quilts, and each time a new one comes out, I hesitate. Do I really need another one? But fortunately, I usually come to my senses and realize that I always learn something new and delightful in each new book! 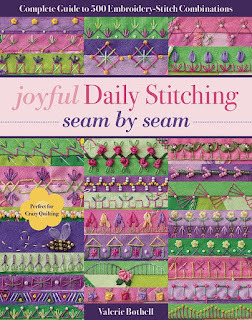 So I joyfully (no pun intended) bring this book to your attention: Joyful Daily Stitching, Seam by Seam by Valerie Bothell. Not only is it visually beautiful, but it is also possibly the best organized of all the CQ books I own. The emphasis is on the seam stitching, although there are basic instructions for CQ piecing as well. The photos of the stitches are beautiful and easy to follow, and many many stitches are shown in beaded varieties as well! This section is followed by 500 different stitch combinations, using thread embroidery, silk ribbon embroidery, and beads. You will want to start immediately!